A record of a continuation of webinar Autopathy I. How to master the new method of healing and self-healing. A stimulation of prana by means of water. 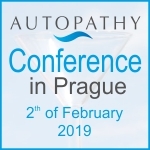 For the past 5-6 years I have been using Autopathy regularly, mostly to prevent and shorten acute diseases and to prevent and minimize complications occurring therefrom. At the same time, I must admit that I have not yet had impressive successes in curing chronic disease.